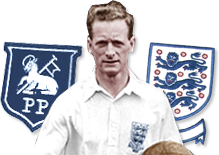 Mention the name ‘Preston North End’ anywhere around the world, and the chances are the topic of conversation will always turn to one man – Sir Tom Finney. It is a testament to Sir Tom’s achievements in his Deepdale days and his superb role as a club ambassador ever since that he is one of those rare individuals seen to be almost as big as the club itself. Proud of his Prestonian roots and proud to play his entire professional career with his home-town club, the man known as ‘the Preston Plumber’ will probably never be surpassed in the position of Preston North End’s greatest player of all time. His official league debut came at the belated age of 24 as the Second World War delayed the start of an astonishing career, with the occasion marked with a goal in the 3-2 victory over Leeds Utd at Deepdale on August 31st 1946. Finney had played many war-time fixtures for the club, but it wasn’t until that day that his career really kicked off. What a career it was too. Though he primarily excelled at outside right, he was equally comfortable in all five positions across the forward line. His record of 210 goals in 473 games would be the envy of many strikers, yet Tom was also involved in the creation of several hundred further strikes for his grateful team-mates. In his third league season with the club, Finney was missing for long spells through injury and North End suffered relegation to the second tier of English football. The club was to return two years later however, with Finney the architect of a magnificent run which propelled the club to the Second Division Championship. Finney turned down an offer of £10,000 – and a villa and a car – from Palermo in an unprecedented show of loyalty to his hometown club. He was the model professional, who never forgot his humble beginnings and an inspiration for fans and team mates alike. In the 1953-54 season, Finney and his team-mates fired Preston all the way to Wembley for the FA Cup Final. But a disappointing 3-2 defeat to West Bromich Albion was the closest Finney came to top level domestic honours for the club. He could take comfort however from being handed the Footballer of the Year award from the football writers after an almost unanimous vote. It was a considerable achievement considering he missed nearly half the league season through injury and was not 100 per cent fit for many games. He won the accolade again in 1956-57, where his partnership with Tommy Thompson blossomed. They scored an incredible 57 times between them in that single season as North End finished third in the league. The next season saw Preston go one better and finish runners-up with Finney again in terrific form. Optimism was high for the 1958/59 season and the Club started the season in terrific form. Finney was moved back to the right wing and the team was challenging for honours again until Finney was injured just before Christmas. He was able to play just one more league game all season and the Club’s form suffered. With injuries taking their toll, Finney finally hung up his boots – to the relief of many defenders – in the 1959/60 season. His last game, a home fixture against the already relegated Luton which North End won 2-0, attracted a crowd of 30,000 to bid their farewells. Ironically, in North End’s first season without the great man, Preston were relegated after struggling for goals all season. Finney played a total of 76 times for England, both as an outside right and a striker, scoring 30 times. At the time his total number of caps was only exceeded by Billy Wright, who played in all but two of Finney’s internationals. He enjoyed a friendly rivalry with Stanley Matthews, who had originally ousted Finney for the right wing role in the side. He was re-instated as a centre forward however, and showed incredible versatility the first time the two played together when Portugal were thrashed 10-0, with both men scoring. Finney also engineered the 4-0 defeat of world champions Italy in 1948, scoring twice in the process. Following retirement from the game, he maintained his initial trade as a plumber, and also took on reporting duties with the News of the World, before a union coup prevented him from continuing without formally ‘learning the trade’! He also served as a magistrate in his home-town for over 20 years, as well as commencing a four-year chairmanship of the Preston Health Authority in 1984. Finney was knighted in the New Year’s Honours List in 1998, an accolade many believed was long overdue. In July 2004, Sir Tom unveiled the water feature sculpture “The Splash” which stands outside The National Football Museum. The sculpture was inspired by the 1956 Sports Photograph of the Year which features Tom Finney beating two defenders at a waterlogged Stamford Bridge. The Preston great spent much of his retirement as a devoted and caring husband to his wife, Elsie, who sadly passed away in November 2004 after a four-year battle with Alzheimer’s.